A month ago, I headed to Phuket for a getaway with one of my friends, Amirul. The initial plan was to stay at Oscar Boutique Hotel (which was further into the city) but my itchy fingers wanted something closer to the heart of Patong so it would be more convenient for us to roam around - so I cancelled the former booking and got my friend who works with Expedia to get us a room here. That is one regretful decision I had to live with and take the blame for. Well, I would usually avoid giving negative reviews and try to look at the best angle possible for every accommodation that I will need to review because every country is different, but I figured, it's best to just be honest - at the end of our stay, all we could think of was that we should have stayed elsewhere. I am still in the midst of writing the overview post for this trip. 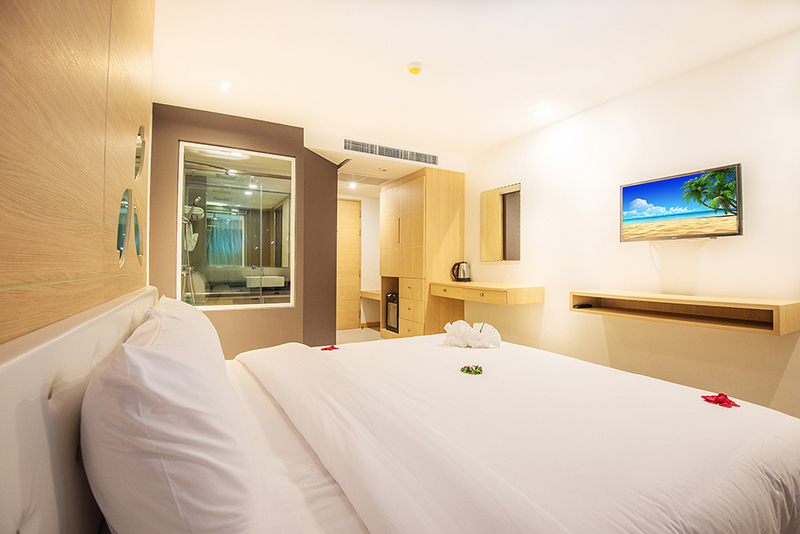 The prime location is definitely what sells the space because the hotel is literally two minutes away from Bangla Walking Street, making it almost in the heart of Patong. 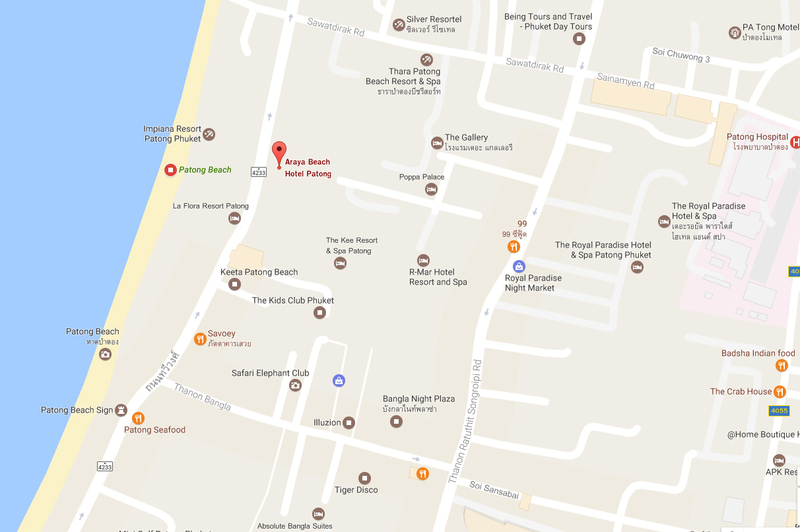 Despite the term "beach" in its name, this hotel isn't literally in front of a beach or has beach access like U Zenmaya, but it is around 500 metres away from the start of Patong Beach. The window and curtains were kept closed most of the time, unless we had to air out our wet clothes or towel. Either way, the only window in our room led to the balcony and it was facing the balcony of the rooms in the opposite building - so nope, no pictures because it wasn't much of a view anyway. Description taken off from their website: Generously sized and attractively decorated, our Deluxe rooms offer the surroundings for a truly relaxing seaside getaway. Our luxurious guest room feature a flat screen TV making this the perfect choice for couples seeking a design-conscious space and modern amenities. The wifi sucked. I don't know if it was due to the fact that the hotel was still under construction or if this was a simply case of lousy routers (we tried through both our iPhones, laptop and iPad) but the wifi was frequently undetectable from our room on the forth floor. It was such a hassle for us to check on our notifications, what more get any work done. The ventilation stinks. We don't really know what could possibly cause it, but the source was from the opening located at the bathroom's ceiling and it will really reek into your main room area if you leave the bathroom door open. The light switches are too far away from the bed. They have those little signage outside of the room for the housekeepers, where you can either put "Do Not Disturb" or "Make My Room". We always put it as DND (because usually, my laptop can't fit into the hotel safe) but we came back and our room was all made up despite putting up the DND sign. Kinda... redundant then. There are no phones in the room. It didn't bother us because a phone would be redundant but if this is of a concern to you or if you are the type to request for wake up calls from the concierge every morning, do take into consideration. There was one night when we came back to our room and the keycard lock on our room door wasn't functioning. We had to go back down to the lobby, waited for the concierge to call their technician who then helped fix the problem - he claimed the batteries ran out of power, which is kinda ironic because this is a newly opened hotel. But anyway, it took almost thirty minutes until we finally got to enter our room. There is a small hairdryer provided, which really made my day because I forgot to bring mine this time. However, there isn't any light or power points near the dressing table / the sink inside the bathroom - which made it quite redundant to have a hairdryer in the first place. You know the saying, "little things matter"? Well they really do and these are just little pet peeves that really got to us. We aren't the type to be easily affected by minute details and we have quite a high tolerance level for annoyance but these were intolerable, for some reason. I'm positively sure that if being taken into receptive consideration and adjusted, it would've definitely made our whole stay even better. We rented bikes while we were there to explore the island's viewpoints. Araya doesn't provide bike rentals like Manohra Cozy Resort does but they do have their own stretch of private parking for hotel guests, which was good enough for us. The hotel boasts a rooftop swimming pool & bar, a highly raved restaurant and a 24/7 fitness center. We were really looking forward to testing out the gym but to our disappointment, when we arrived, it was still being built. So was the bar, restaurant and even the swimming pool wasn't completely ready. The rooftop swimming pool was open for public usage and the view from the rooftop was surreal - with the mountains on one side and the palm trees along the beach on the other. While it was a great place to chill and get some tan (we even caught the sunset on one of the nights before a night swim) it was quite a turn off for us, the fact that their the jacuzzi and filtration system for the pool that was open for public, wasn't even running. Only the bottom deck was accessible. The top deck and the bar were still under construction - with men working while you bask in the sun. It gets kinda awkward but we just minded our own business. Upon arrival, we were served fresh fruit juice and the staff at the concierge were really friendly and helpful, readily available to answer all of the annoying queries that we had - that is one thing we both love about Thais. They are so genuine and definitely the people belonging to the land of smiles. Unfortunately, we had a few minor hiccups towards the end of our stay. I wanted to request for a late check out since he had to attend the private Muay Thai training session the day of our departure. This would usually not be a hassle elsewhere - I stayed at three other hotels in Phuket and they simply tell us a) whether or not we can extend and b) inform us of the prices that we'll be charged additionally, if any. However, the front counter staff at Araya was unsure of their extension policy and told us to come back the next day - which we did and was served by whom we assume are the higher management of the hotel, two Indian gentlemen. Why do we assume such? They were not wearing the Araya uniform (they were clad in formal wear) and every time one of the staff was unsure of something, they would turn to these gentlemen. To our surprise, even they were unsure of the extension policy too. When asked how much it would cost to extend our check out timing, he replied, "Probably...... 300 to 400 baht per hour". The view from the rooftop pool, the comfy deck chairs, the hotel staff (not the management), the comfy and clean rooms. The design flaws within the hotel and the fact that the hotel wasn't completed yet when we stayed - construction noises, scaffolding and debris everywhere, mainly at the hotel front / new building. The hotel management and their level of efficiency. The wifi. We hated the wifi. Probably, but it isn't a definite yes from neither of us. The hotel has great potential (especially looking at the prime location) but both of us felt that at the time of our stay, the hotel wasn't ready for operation yet - both the management and the facilities. This blog post was not written under any pressure, endorsement or sponsorship of any of the parties mentioned. All thoughts and opinions here are as always, our own.